Dhansak is a popular Indian curry made from meat and lentils, flavoured with spices including cumin and ginger. It is mild, sweet and rich with just enough heat to satisfy most tastes. And best of all it benefits from being made a day in advance as it tastes even better the next day. I like to serve this with Raita and FreshTomato Relish as well as hard-boiled eggs, poppadoms, rice and, of course, mango chutney. Make 1–2 days ahead, keep in the fridge, then reheat thoroughly. Transfer to a freezer-proof container and freeze for 1 month. 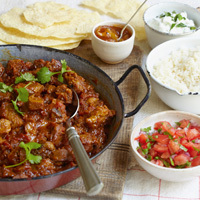 Don’t freeze for longer as the flavours will intensify and the dish may become too spicy. 1 Preheat the oven to 150°C/130°C fan/Gas 2. 3 Add the remaining oil to the pan.Add the onions and fry for 4–5 minutes until beginning to soften. 4 Meanwhile, place the ginger, garlic and chilli into a small food processor and whizz until finely chopped. 5 Bash the cardamom pods with the end of a rolling pin to split the husks, then remove the seeds and grind them to a fine powder in a pestle and mortar.Add to the pan along with the remaining spices and the garlic and ginger mixture. 6 Add the remaining ingredients to the pan and add the lamb. Bring to the boil, then cover and place in the oven to simmer for 1–2 hours until tender. Check the seasoning and serve. Keeps for 2 days in the fridge. 1 Cut the cucumber in half lengthways, scoop out the seeds and cut the flesh into small cubes. Place in a bowl with the yoghurt and mint and chill for up to 2 days before serving. 1 Mix all the ingredients together and chill for up to 2 days before serving.